Custom molded urethane valve balls for all industries. Urethane offers superior life to rubber valve balls and can be custom madeto any specification. 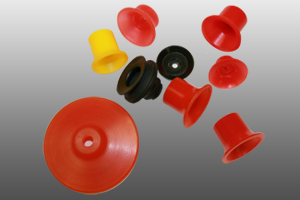 Urethane core plugs are inexpensive in comparison to machined plastic and last practically forever. Core plugs can be molded in any custom shape and size. Urethane oil pipe seals are oil and cut resistant for increased life without swelling. UUP can manufacture standard pipe seals or custom manufacture to meet your requirements. Urethane roll coverings for conveyor rolls designed to be pressed on steel roll. Roll coverings can be kept in stock and roll does not need to be sent in for recovering. Urethane Pallet caps provide protection for stored coils of steel and aluminum. Pallet caps are made to fit over any size or shape pallet. Urethane shaker and sizing screens for rock and gravel sorting machinery. Screens are made with all sizing holes and can be made to custom shapes. Urethane chute liners custom made to fit any chute. Durometers from 75 shore “D” to 80 durometer shore “A”. 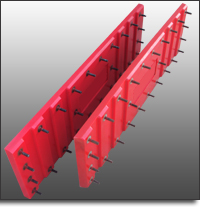 Side trimmer chute liners are made to cut down noise from side scrap and protect the trimmer chute from damage. Liners are made to fit in the trimmer chute. Standard sized muller liners are available. Liners can be custom made to any sized liners that may be required. Urethane offers superior life versus a rubber muller liner. Urethane dunnage parts for the auto and plate glass industries. Dunnage parts are used for transportation and storage. Rack liners made to transport plate glass and solar panels. Rack liners are formulated to resist wear and tear from sharp edges on plate glass and solar panels. Chopper cots for fiberglass chopping industry. We have specially designed formulas for long cot life and high quality glass cut. Original manufacturer of no-crush feed rolls for corrugated box industry. All sizes for all types of folding box equipment. Gears made from urethane are low cost in comparison to metal and plastic gears. Urethane gears will shear when a machine jams saving further machine damage. 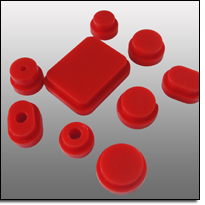 Urethane suction cups for can manufacturing and plate glass handling. Standard sizes available and custom molded cups can be made.